Maple trees stand ready to burst forth with golden-bronze highlights. Beechnuts tickle the leaves as they fall to the ground. Red tinges the leaves of the burning bushes. Pumpkin patches set ablaze with orange, plump fruit. My favorite time of year. Fall. It always brings to mind the seasonal word harvest. Just as nature, we, as Christians, have circumstances that bring rain, sunshine, heat, cold, storm, calm, dryness, fire, and flood. Our aim is to always work toward having a spiritual harvest, no matter what the circumstantial season. But how do we produce the luscious harvest God desires for our lives? What is damaging the harvest in your life? Hmmm. Do you have any roots of unwanted growth? I know I do. Any roots of bitterness, unforgiveness, pride, jealousy, judging, gossip, complaining, doubt, worry, or hypocrisy, among other things, will destroy the possibility of an abundant, spiritual growth and harvest. The roots of unwanted growth must be ripped out in order to have good soil. What are you harvesting? Is the soil of your heart producing what it should? Or maybe you have a mixed crop, having planted negative seeds in with the positive seeds? Reproducing the character of God in our lives requires the planting of His Seed-Word in our hearts, not the seeds the world spits at us. There can only be one Seed in our hearts! “A life in the Hands of the One guiding the plow will display a fruitful meadow.” May your life be cultivated by the Husbandman that it may “produce a harvest of fruit, of nourishment, of good things for others.” And may your harvest be plentiful! 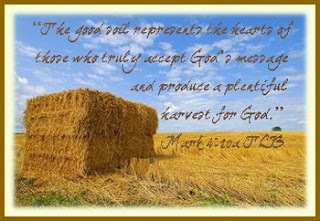 Today’s post is part of the ChristianWriters.com blog chain on the topic of harvest. For other great posts, check out the list in the right sidebar. Please join me over at LivingBetterat50+ for my new place of monthly devotionals. I loved this, Lynn. I’m afraid my soil is filled with potatoes. I planted them years ago and no matter how much I till my soil to help the wheat grow strong, I keep finding potatoes. LOL Carol, you are such a hoot! Too funny! Thank you,sweetie, for all your wonderful comments! You make my heart happy! Bless you! Ripping out the roots is hard work but necessary to please God. 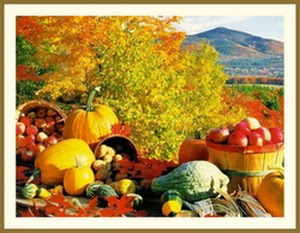 Thanks for reminding us how to best please God and reap a great harvest! Terrific post, Lynn. As I read it, I couldn’t help but wonder what seemingly good seeds I have planted that might not be what or where God wants them. Of course we have to be on the lookout for the tares and weeds, but I think sometimes we need to ask God if we’re planting barley where He wants wheat or oranges where apples are better suited. I’m thinking specifically of hobbies, activities and other commitments that might be leaching away the nutrients of our soul’s soil and not allowing what’s supposed to be growing to come to maturity. I am not really into wheat or potatoes, can I plant pumpkins or watermelon instead? Nice illustration of the sower and harvester in our lives. As always wonderful and just a much needed message. Once again our harvest posts will be similar. I guess God puts almost the same things on our hearts. I always love reading your messages. Oh Lynn, what a wonderful word the Lord whispered to you. I just kept reading it over and over. As I press into Him and get closer to the things of God, I’m letting him pull out those roots that shouldn’t be there. I want Him to be the only seed in my heart. I long for that. Thank you for sharing this beautiful post! This is beautiful Lynn, a beautiful analogy of what God is doing in our lives. Fall is my favourite time of year also, the time our senses are heightened more than any other, but also a time of quiet reflection. Thank you for sharing with us from the richness of your heart. Great post Lynn! Sowing and reaping, seed-time and harvest. Lord, you have given me the tools for planting. May my heart be a tender and fertile place for growth and may it’s bountiful harvest bring You all the glory! Beautiful gentle whisper! Beautiful post. Sometimes its so hard to have the roots pulled up — painful, but necessary. I can be so short-sighted sometimes, forgetting to look past the moment, beyond my current circumstances to the hope that lies in God alone, author and creator of my life, the sure and steady Hand that thankfully refuses to leave me to my own designs. Fall is my favorite time of year, too. I’m not much of a gardener, though, I admit, and I do not look forward to any of the tasks associated with it, whether it be planting, tending, harvesting or cleaning up after wards … I hope this doesn’t translate into my spiritual life. Yes, I think we all have some weeds growing among the wheat no matter how hard we struggle. But with God’s Word, we can grow less and less weeds and more crops. Thank you for another beautiful post, Lynn. And Carol, coming from potato country, your comment is well note, although we WANT to find potatoes, but no weeds! Beautiful Lynn! The fruit? I hope that it looks like love, joy, peace, patience, kindness, goodness, faithfulness, gentleness and self-control. Sorry about arriving late…busy week. Fall is my favorite time of year as well. And I agree with the quote, “As you sow, so shall you reap.” I think that’s the root of many of our nation’s current troubles. So hard. It takes faith to even *want* to do that. Thankful for God in my life. =) Excellent. Just what I needed to hear today, actually. Instead of whining or complaining, I’m going to switch bags. Oh, Lynnie! that was wonderful! My soil always neds this type of churning up! ← A Blog Award! ← Ecclesiastes…Ever Studied It?